For external use only. Avoid contact with eyes. If contact occurs, flush thoroughly with water. This product may cause irritation. If excess irritation occurs, discontinue use. Avoid unnecessary sun exposure and use sunscreen. 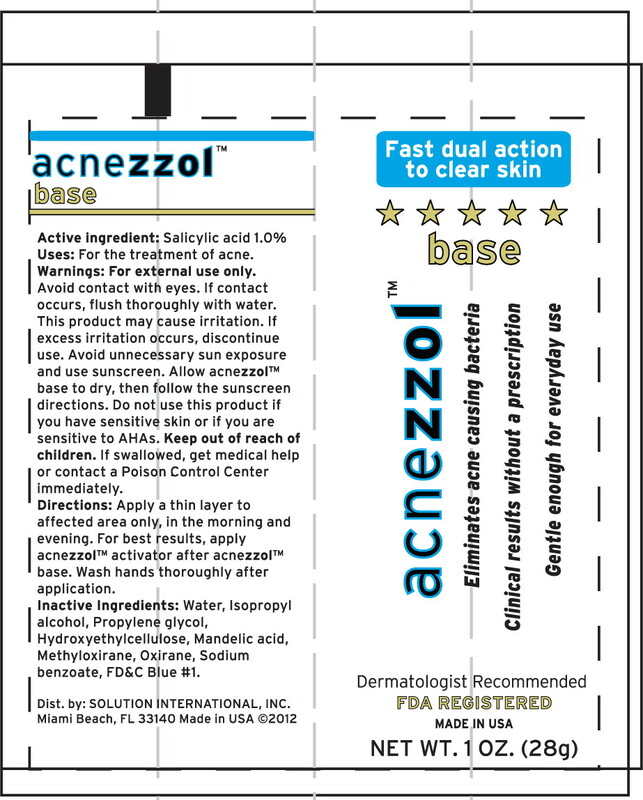 Allow acnezzolâ„¢ base to dry, then follow the sunscreen directions. Do not use this product if you have sensitive skin or If you are sensitive to AH As. Apply a thin layer to affected area only, In the morning and evening. For best results, apply acnezzolâ„¢ activator after acnezzolâ„¢ base. Wash hands thoroughly after application. Water, Isopropyl alcohol, Propylene glycol, Hydroxyethylcellulose, Mandelic acid, Methyloxirane, Oxirane, Sodium benzoate, FD&C Blue #1. Dist. by: SOLUTION INTERNATIONAL, INC.